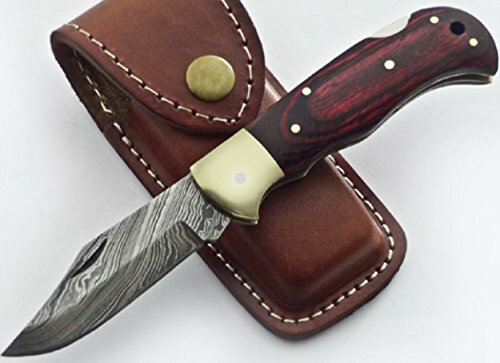 FN-9034, Custom Handmade Damascus Steel 6.5 Inches Folding Knife - Beautiful Red Doller Sheath Handle with Brass Bolster Over All Length = 06.05 Inches, Blade Length = 03.00 Inches Handle Length = 03.50 inches This By 1095/15N20 (176 true Layers) Hand forged to Beautiful Pattern. Damascus steel of this knife has high quality contents to give an excellent edge and sharp cutting abilities. Hardness of the blade of this knife is HRC 58-60 in the lab & been hand sharpened to a Sharp Edge. Handmade Durable Leather Sheaths Included. BUYING You must be sure and certify that you are 18+ of age and you are able to legally purchase and own an item and will use it responsibly. If you have any questions about this product by Poshland Knives, contact us by completing and submitting the form below. If you are looking for a specif part number, please include it with your message.